Cloverdale, B.C. – Fire runs in the veins of third generation welder Jaeden Wildenboer. 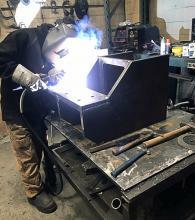 An apprentice welder and graduate from Kwantlen Polytechnic University (KPU) through the Youth TRAIN in Trades program (former ACE IT program), Wildenboer is back to defend his regional title at Skills Canada BC regional competition for the Lower Fraser Valley region this Friday at KPU’s Tech campus in Cloverdale. Wildenboer and a slew of other trades students from the Lower Fraser Valley will gather at KPU’s Tech campus this Friday to throwdown in the first of several regional competitions eventually reaching international levels. The annual Skills Canada BC competition offers young aspiring tradespeople across the province the chance to showcase their mastery of trade and technology related skills in Olympic style events. The winner of the BC Skills competition competes in the Skills Canada competition where they have the opportunity to qualify for the Skills World competition. In addition to welding, students from the Surrey and Delta school districts will have the chance to show off their skills in architecture, automotive service, carpentry, fashion technology, mechanics and plumbing. All trades for which training and certification are available for at KPU. KPU faculty will be directly involved, volunteering their time as judges for several of the competitions at the regional, provincial and international levels. The competition kicks off at 8 a.m. and runs until 2 p.m. on Friday, Feb. 24 at KPU Tech (5500 180 St, Surrey). The KPU Richmond campus (8771 Lansdowne Rd, Richmond) is also hosting Skills Canada BC for the Central Lower Mainland students on March 2. For more information on the competitions, visit skillscanada.bc.ca.